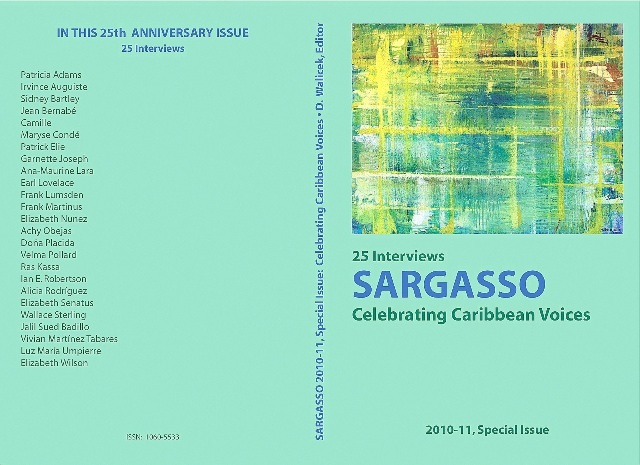 This special issue of Sargasso, published in 2011, commemorates its twenty-fifth anniversary. The journal began in 1984 as a small collaborative effort with a strong vision, but without steady funding. Addressing diverse Caribbean topics over the years, its issues have featured academic essays, interviews, short fiction, poetry, and book reviews. Today it has grown into an interdisciplinary peer-reviewed publication with a dedicated staff and institutional support. This volume marks these accomplishments with a collection of twenty-five interviews. This 25th anniversary special issue showcases Caribbean voices across more than twelve Caribbean nations to address five main themes: memory, writing, linguistics, activism, and popular culture. Interviewees include acclaimed writers Maryse Condé of Guadeloupe, Earl Lovelace and Elizabeth Nunez of Trinidad and Tobago, Velma Pollard of Jamaica, and Luz Maria Umpierre of Puerto Rico, joined by the voices of other important Caribbean figures such as Curaçoan linguist Frank Martinus, Jamaican artist Ras Kassa, and former Puerto Rican political prisoner Alicia Rodríguez. Most of the contributions are in English, with five in Spanish and two in French. The issue is not included in the normal subscription fee. If you wish to order this special issue, please use the Purchase and Subscription form, print the form, and then return it with payment. The issue is sold for $10 (individuals) and $25 (institutions).